The referenced field is not found in a linked data type. The referenced cell doesn't contain a linked data type. Note: You can insert linked data types from the Data tab. You can also write formulas that reference them. When a new column tries to reference a field from a data type record, but the record doesn't have any data for that particular field, the #FIELD! error will occur. For example, if you added a column to show stock expense ratios, but the stock record on that row doesn't have an expense ratio in the first place, then the result is #FIELD!. If Error Checking is enabled, click the Error floatie to the left of the cell, and choose the Ignore Error option. Remove the column, and replace it with a new column that references a field that does have data. 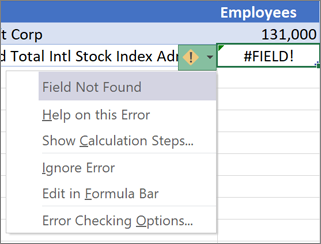 If you type a formula like =A1.City, or =FIELDVALUE(A1,"City"), and cell A1 doesn't use a Geography data type, the #FIELD! error will occur. Similarly, if you create a formula like =A1.Price, or =FIELDVALUE(A1,"Price"), and cell A1 doesn't use the Stocks data type, then the error will occur. This can also happen when a formula references a field from a data type, but the data type doesn't have any data for that particular field. For example, if you entered a formula like =A1.ExpenseRatio, or =FIELDVALUE(A1,"ExpenseRatio"), but the that particular stock doesn't have an expense ratio in the first place, the result is #FIELD!.